Vitamix 7500 Review - Got Greens? This G-Series Vitamix is the latest release – how does it compare to the Classic 5200? Designed to perform like no other blender, the Vitamix 7500 is an evolution in performance blending. Like all Vitamix blenders, the Vitamix 7500 is not your average kitchen blender. This appliance is made to perform. Not only will you be able to make nutritious smoothies and frozen drinks but this machine can easily crush ice, grind grains, make nut butter, ice cream, and hot soups. 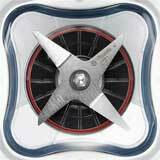 With its powerful 12 amp, ~2.2 horsepower motor the 4 prong stainless steel blade spins over 270 mph (~24000 RPMs). The latest design from Vita-mix is built for performance and speed but unlike any other blender on the market it is also capable of slow speeds, ~500 RPMs, for precision control. Not only can the impressive powerful motor blend most any food item without issue but research has proven that the speed of the Vitamix can break through plant cell walls. This is important because much of a plant’s nutrition lies within its cell wall which is too strong for the human digestive system to break down. The result is that the Vitamix 7500 delivers more accessible nutrition for your body. Vitamix 7500 Review of noise level – If you are familiar with high-performance blenders then you are aware that a major drawback is that these powerful appliances are loud. If you have experienced a Vitamix 5200 or older model then you know. There is good news with regard to the Vitamix 7500. While this new design has more power than previous classic models the motor base has been re-engineered to include additional vibration dampening and enhanced airflow management much like what you would find in extremely expensive commercial blenders. The result is a dramatic reduction in noise. Vitamix has reported a 7 decibel reduction in sound, equivalent to a 40% quieter Vitamix. Compared to the Vitamix 5200 and 6300, the G-Series is noticeably quieter. We LOVE this container! 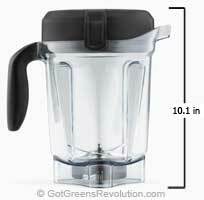 No Vitamix 7500 Review can over-estimate the value of the new 64-oz container. If you are familiar with other Vitamix blenders then you are likely familiar with their tall 64 oz containers. A wonderful feature of their containers is that they are UL rated to be used at FULL capacity. Therefore, unlike most other blenders, a 64 oz. container can blend 64 ounces. While Vitamix was one of the first companies to include a BPA-free blending container they were known as one of the tallest. Many consumers like to keep their blender on top of their kitchen counter and were disappointed to find that they could not fit their blender with the container on top under the kitchen cabinets. The new low-profile 64 oz container included with the Vitamix 7500 solves that issue. The new container is much shorter than previous 64 oz containers. At slightly over 10 inches, compared to the previous height of 13.5 inches, the Vitamix 7500 with a total height of 17.5 inches, easily stores under most kitchen cabinets. Not only is the height an improvement but the result is a wider base with a bigger blade making it even more efficient and easier to do chopping tasks. It is also easier to clean. We found this to be the BEST improvement. In comparing the Vitamix 5200 vs 7500, there have been some other subtle but significant improvements. A feature unique among Vitamix blenders which has made them famous is their Variable Speed Control. A simple dial allows you to control the precise speed of the Vitamix. It works in the same manor as a volume dial on a radio, the more you turn the dial the faster it blends. This allows for completing a wide variety of tasks that are otherwise difficult, or not possible, with most other blenders such as chopping vegetables, making salsa and doing delicate mixes. While the Vitamix 5200 gave incredible control to your blending pleasure, the 7500 is even better. There is no longer a “High/Variable” speed switch. Now the Variable Speed Dial has complete range from its slowest speed to its maximum speed. Also, the speed variation is more precise; when you place the dial between 2 and 3, for example, it will always be the exact same speed every time you place the dial in that position. In addition to the speed control improvements, the Vitamix 7500 has a Pulse feature adding additional control over your blending. A great detail of the pulse feature is that you can pulse at any speed. The speed of the pulse is determined by the position of the Variable Speed Dial. With over 70 years experience in making performance blenders, the Vitamix 7500 keeps the Vitamix tradition of including the industry’s best warranty, a 7-year full warranty. Made in the USA, the entire blender and container is covered for a complete 7-years, a warranty that is transferable. Therefore you can be confident in your purchase; it is not uncommon for regularly used Vitamix blenders to last 20 years or more. THE BOTTOM LINE – If you are series about your health and you are looking for the very best that a blender has to offer then you can not go wrong with a Vitamix 7500. At ~$529, it is not a cheap purchase by any means but as the saying goes – “you get what you pay for”. While you can still get the very popular » Vitamix 5200 predecessor for ~$80 less you won’t get the quieter motor nor the shorter more efficient container and without the additional improvements. For us the sound and improved container is more than enough to justify the price difference. Order your Vitamix 7500 to get all the benefits plus Free Shipping and the best price. and we’ll give you FREE shipping and more. What do you think of the new Vitamix 7500? Hi can we use 5200 container on the 7500 I mean on g series any recommendation! you can use the taller 64-oz container on any g-series, including the 7500. All classic containers are compatible with the g-series. I am Canadian and have been considered a powerful blender for a while. I initially wanted to buy the Total Nutrition package from Costco at $699CAD but couldn’t see the use of having both a 64oz or 48oz container. A $599CAD package includes the dry grain and tall 64oz container, but we don’t yet know whether the dry grain container would be of any use to us since we are primarily frozen drink/smoothie drinkers. Then I saw a wicked Valentine Day sale on Amazon.ca for the 7500 at $547CAD (Costco price is $629.99$). So I bought a 7500 instead. I am wondering if the purchase of a separate 32 oz container is worth it if I intend to make a lot of single smoothie batches, or whether the 64oz will produce identical results albeit with the help of the tamper? I ask because one of your comparison comment mentions how the wide base of the new container makes it more difficult to efficiently work with small volumes. Congratulations Francis – it sounds like you got a great deal on Amazon! The 7500 will not disappoint. Whether or not a separate container is worth it depends upon how much you will actually use it. Small volumes can become a challenge only if you are making blends less than 2 cups (~500ml) and it really depends on what you are blending. My suggestion is to use your 7500 and make your single smoothie batches. After a few blends you should have a good indication of whether or not it is working for your needs. Less than 2 cups for smoothies is unlikely, but if I am making a mayonnaise or hollandaise when you start with a very low amount of liquid at first, that is where the 32oz container shines I assume? The cost of the 32oz container is about the same as an immersion blender though, so I think I will wait and see as you say. 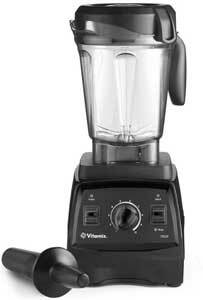 I realize you prefer the 7500 to the 5200 Vitamix model by your reviews. However I am a senior who would use the Vitamix mostly for making healthy smoothies, ice creams, custards, soups, veggies etc. I read some reviews on the wider/lower 64 oz. container of the 7500 model and that it doesn’t do a good job on small amounts of food or liquid therefore I presume I would not use it very often. Also it would not fit under my counter as it seems to do for others. A titch too tall! As a result I have read that it was recommended one purchase either the 48 oz wet or 32 oz wet container to compensate. Therefore seems like a waste of money for me to buy the 7500 even knowing that it is a newer update with a stronger quieter motor etc.etc. So as a result I am giving thought to buying the 5200 instead with the 48oz container. It seems like it would suit my needs better???? I am at a dilemma if I am doing the right thing. Another question I have is I love the color white but concerned if I choose that color base will the base machine stain badly from the fruit or whatever might splash/drip on it when being used. Also my concern as well if the white base machine will or can turn yellow in time like some white appliances do as they age. I realize that the actual containers do also get cloudy with use. Any comments on my concerns above would be very much appreciated. Hello Deena, thank you for your feedback, we appreciate it! It looks like you have done your homework and have a solid understanding of Vitamix model differences. If the extra cost of the 7500 for the benefit of the container and less sound is not a priority for you then a 5200 will serve you well. Having the 48-ounce container (our favorite) will allow your Vitamix to “fit under your counter” as well. The only drawback to the 48-oz is volume, but only if you will be blending volumes greater than 48 ounces – and of course, there is always the option to purchase a 64-ounce container later if you find the need. The bases are great quality and well designed to be stain resistant. We have not ever seen a stained white base nor one that has yellowed. Is ii possible to purchase the 7500 with the 48oz j instead of the 64 0z ? Is the 64oz taller than the 48 oz, or is it just wider? It is not possible to purchase a a 7500 with the 48-oz container, the only package currently available is with the compact 64-oz. There is a G-Series blender that is available with the 48-oz container, it is the Creations Elite. It has the same motor base as the 7500 but comes with the 48-oz jar and a different cookbook. The compact 64-oz and 48-oz containers are essentially the same height, the 64-oz is wider with a wider blade. Love my 7500! Question about the Vitamix cookbook, “livefresh raw/vegan/vegetarian.” Are the recipes compatible with the G-series or just the C-series? Cindy, the recipes in the Livefresh cookbook can be used with your 7500 (an other G-Series). Just note that when a recipe states to turn the switch to ‘hi’ speed, you want to have your 7500 turned to maximum speed 10. Purchased this Vitamix 7500 blender from QVC about 5 or 6 weeks ago and have used it every day except one since. Initially I thought that it was a bit pricey, but after seeing what it can do and how it has changed how we eat I think that it is the bargain of the century! Had a hard time spending this much money at once so did the installments. Hot soup? I had a hard time believing that a blender could heat up ingredients so quickly but when I tried it I was amazed. Not only do you use up small amounts of leftovers, the finished product is great. Have started making my own almond milk with two ingredients, almonds and water. It doesn’t need salt, sugar, vanilla or chemicals; it is delicious and I have stopped using milk in my coffee. The leftover pulp is fantastic in baked goods, imparting a silky texture and a rich flavor. My grandson is a picky eater and will not touch many veggies so I make him a fruit smoothie in the morning with a handful of baby spinach and some zucchini and when he drinks it down he has had four or five servings of fruits and veggies. If you are on the fence about purchasing this blender, jump off and do it, it’s a great investment. Thanks so much for your feedback Barbara. How awesome your grandson is happily eating greens! Hi, I am located in Singapore. I can only find the 5200 available here. Any idea if the 7500 will be available soon? I very much prefer to get the 7500! By the way, no idea why both the Vitamix and Blendtec cost more than SGD 1k here. The exchange rate doesn’t justify this cost. But oh well… no choice! Each country has its own regulations and requirements for electric appliances, I am not familiar with those of Indonesia. Below is the contact info to our Vitamix representatives near you – contact them for the most current info on models available in your area. All the best in your search, please let us know if we can assist further. My friends are in US and I ask them to buy for me Vitamix and bring it in Slovakia. I am concerned about the voltage. Is it ok to buy vitamix in US and use it in Europe? If yes which type of vitamix? We get this question often. Voltage is definitely an issue. 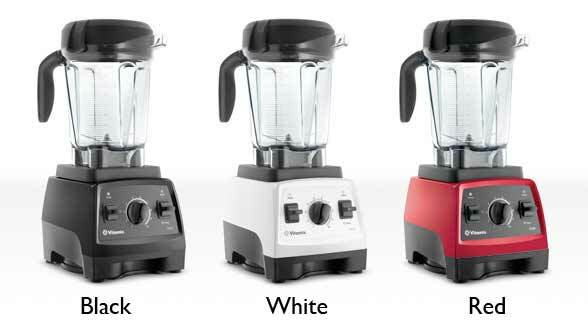 Vitamix blenders made for the US market are made specifically to meet US safety and EMC standards for 120V use. In short, Vitamix does not recommend the use of a convertor or transformer. Also, the warranty coverage is for use in the US only. Please let us know if this doesn’t answer your question completely. I am so excited to receive my first vitamix ever. I also have ordered the dry container on back order. I understand wet container blends down & dry blends up do to position of blades. Can you blend wet things in the dry container as well ? Congratulations Vicki! You are going to LOVE your Vitamix. Yes, you can blend wet things in your dry container as well – it just isn’t as efficient. I ORDERED A 7500 CAN I USE A SMALLER 48OZ CONTAINER ON 7500? You can use the 48oz as well as the 32 oz wet and 32 oz dry grains container with the 7500. You are going to love the 7500! What a thorough Vitamix 7500 review. Thank you so much. I now understand the difference between the 5200 and the 7500 – never cared for the Vitamix 6300. One question though… how does this compare to the Blendtec Signature Series? Jinny, you can see how the 7500 compares to the Designer Series here – the Signature series is essentially the same blender as the Designer Series, with slightly different programs. At this time it is not possible to purchase only the new jar that comes with the 7500, even in the US. It is not recommend to use it with the 5200 – the wider base and larger blades have been tested, certified and approved only for the 7500. The 7500 has a slightly more powerful motor to help compensate for the longer, heaver blades of the shorter half gallon container. therefore, the larger container is not recommended for the 5200 motor. It could put a “strain” on its less powerful motor. I recommend using the 48 oz container. It is my favorite of all the available containers, to include the shorter 64 oz. Hi, could you please tell whether the new 7500 jar will fit into 5200 motor? It would me much appreciated. It does fit on the motor base but Vitamix does not recommend using the new 7500 container with the Vitamix 5200. I love my Vitamix 7500 but I can not fill it to its stated capacity. Anything over 5 cups and the liquid starts to spill out over the well-fastened cover. Is this a design flaw or just my particular machine? We have had no issue blending 64 oz smoothies in the Vitamix container and 5 cups should be no issue. I suggest you contact Vitamix customer service to determine if there is an issue with your unit. I am in Spain. I would like to buy a vitamix 7500 from America but concerned about the voltage. Is there a way Vitamix can help? As mentioned above, the Vitamix 7500 is currently not available for the European market, consequently it is a 120 volt unit specific for North America. Vitamix does not recommend using a converter for their blenders which will void the warranty. Do you know when it will be available in Canada and what the price will be compared to the 5200 currently offered on the Vitamix website and Coscto website? Alex, Vitamix has yet to release information regarding the Vitamix 7500 for Canada. We have been told that it will be available for Canada but there was no release date or pricing at this time. Hi, could you please tell me whether the 7500 container will fit into 5200 motor base? Hello, I love this one and the Pro 750, but in France we only have the 5200. Do you know when these will be sold in Europe? noon, Vitamix has yet to release any information regarding when the 7500 series will be available for the European market. I have the vitamix 5200, 6300, and the 7500. All i can say is you can’t go wrong on anyone! The 5200 is perfect and everything is always smooth. The 6300 has the pre-sets and are nice when i don’t want to wait by my vitamix. The new 7500 is great because of the size and pulse button. Any Vitamix you buy you will love!! Completely agree Lance. Thank you for your input. The dry-grains container works on both the 7500 and 5200. There is no notable difference between using it with either one. As for the normal containers, as mentioned in the 7500 Review above, the newly designed 64-oz container that comes with the 7500 has several advantages over the taller ones that comes with the 5200 and other models. Can the newly designed 64-oz container that comes with the 7500 be used with the 5200 series? Andy, at this time Vitamix does not recommend the new 64-oz container be used with the 5200 series. We have tried it on the 5200 without issue but pretty much use our 7500 exclusively now. My brother in law sweared that Costco sold this. I went there to buy it and found out, after an argument with the manager, that there is no Vitamix 7500 at Costco – they don’t sell them! Anyway – great review, my 7500 arrived yesterday just in time for Christmas and I LOVE it! Costco itself does not sell them. But, they periodically have demonstrators set up a station whereby they sell different products. They did this for Vitamix. Sams Club also does this, too. almost bought one this last week at Sams. So, your relative was correct. My son bought one at Costco from a demo! Really they bought a 7500? I know there are demonstrators but never seen them sell the 7500. Just wanted to say thank you for the best vitamix 7500 review. I returned my vitamix 6300 and got one. You are welcome Bobbi – I’m glad to know we were helpful. Enjoy your 7500!